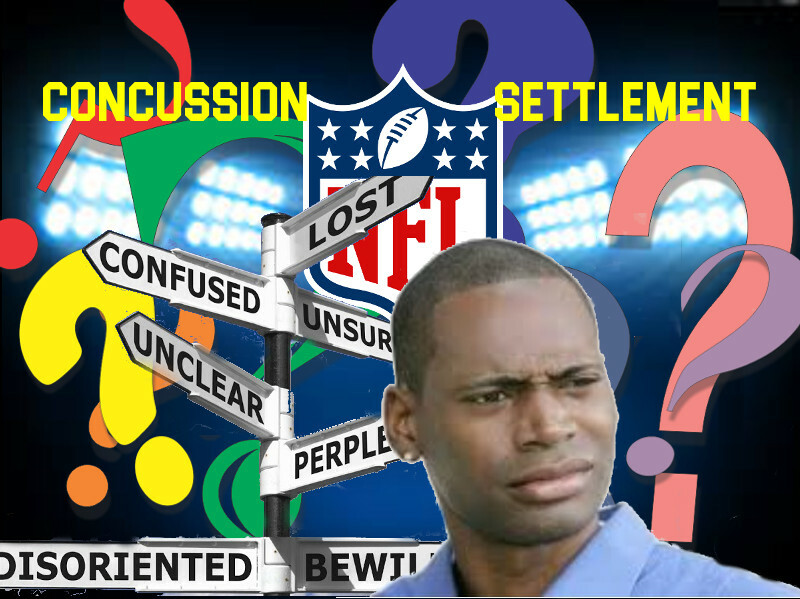 I shouldn’t be writing a fourth article on NFL Concussion Settlement FAQs. I shouldn’t have to write four different articles including a 4,200+ word essay strictly on FAQs describing the claims process. But here we are. It is beyond me how an neurological impaired retiree is supposed to comprehend a 69-page set of FAQs that present more questions that answers, or at the very least in which the answers present numerous additional questions. I have to wonder if NFL players who are dealing with a brain filled with globs of tangled tau-proteins will even make it past the first section of the FAQs or even my writing and if they do, they’ll remember what was written in one paragraph as they move on to the next. I already know the answer. Most won’t. I recall stories related to me by retired players who are struggling and their family members. Men who constantly get lost and then sit in their cars for hours waiting to gain their bearings and figure out where they are so they can drive home or for someone in their family to find them. Men who have difficulty remembering how to get dressed. Men who can’t remember how to use a can opener. Just before Christmas a distraught wife told me how difficult it was for her when she gave her husband a Christmas card for their daughter for him to sign. She said that he looked at her with a blank stare and then asked, “Should I just sign it [first name]? She had to remind him, “No, sign it ‘Dad.’” I could go on and on. But the FAQs these guys are supposed to understand need to be deciphered so onward I suppose. Hopefully someone will help them. The remaining FAQs address lawyers and liens. Co-Lead Counsel Christopher “Chris” Seeger of Seeger Weiss was appointed to his position to lead the Class by Judge Anita Brody. He is one of a handful of plaintiffs’ lawyers whose main practice is MDL and Class Action litigation. He represents few individual clients in the settlement and was recently shown to have been a director at Esquire Bank, a legal funding corporation. He resigned from that post after a New York Times article reported that he was pursuing settlement funders which he stated had mislead Class Member into taking settlement advances at predatory interest rates. Sol Weiss, or Anapol Weiss, was selected by fellow attorneys as Co-Lead Counsel to serve alongside Seeger. Like Seeger, his practice area includes mass torts and class actions, but also personal injury cases, so unlike Seeger, he had filed previous litigation on behalf of his player-clients, which was consolidated into the MDL. Steven Marks of Podhurst Orsek, and Gene Locks of Locks Law Firm, were selected as Class Counsel; both of these law firms specialize in personal injury and class action lawsuits, and both firms represent a large number of individual clients in the concussion settlement. Arnold Levin of Levin Sedran & Berman, and Dianne Nast of Nast Law, were appointed to their positions by Mr. Seeger; both of these firms are part of the handful of mass tort plaintiffs’ attorneys along with Seeger and to my knowledge do not represent individual clients in the Class. While I’d prefer to focus on the retired players, I take this detour because it is instructive and useful to know a bit about the attorneys who are heading the case. The allocation table is taken from Seeger’s proposal regarding how to divide the $112.5 million common benefit fund which the NFL has agreed to for attorney compensation. The lodestar figures, on which Seeger has based his allocations, represent the time and expense each firm has contributed to the Class as a whole. The multiplier figure is a subjective number assigned by Seeger as to value he perceives each party to have brought to the case. A multiplier of “1” would be a break even point for the firm’s investment in the case; therefore since Locks Law, who was given a lower multiplier of 1.25, would make a profit of $771,125. On the other hand, Seeger submitted a 3.885 multiplier for his own firm, bringing the $70,415,116.45 that he has allocated for Seeger Weiss a profit of $52,290,247.35. Other counsel have raised concerns and objections regarding both the high lodestar and multiplier that Seeger commandeered. One objection is that a large amount of Seeger’s lodestar was communication with Class Members, while all other attorneys were forbidden from including this time in their own lodestars. Since all six of these firms have been listed as Class Counsel, might it not be reasonable to believe that they have fielded phone calls on behalf of the class in addition to their own clients? From an onlooker’s viewpoint based on public filings which support the interest of the Class, those who’ve actively sought favorable processing of claims have been punished from a multiplier perspective while those who’ve been silent or engaged in the administrative tangle of creating procedures to delay and deny them have been rewarded – at least to a greater degree. In addition to this, Seeger requested an additional 5% of each approved claim to be used for administration and implementation of the Settlement. Locks and several other attorneys who served on the Executive and Steering Committees opposed this and said it was unnecessary. Harvard law professor William Rubenstein, who was appointed by the court to provide an expert opinion on attorney fees, also opposed this, demonstrating that in other class action settlements the common fund was intended to cover both the negotiation and implementation phases. 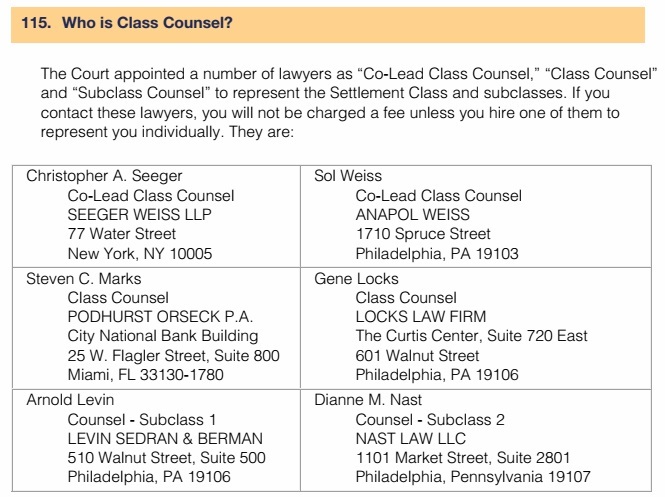 Since all six of these attorneys are presented as Class Counsel in the FAQs, would Class Members have the option of contacting any of these lawyers with reasonable expectation of help in navigating the Settlement? If those Class Members who’ve lost faith in Seeger should choose to communicate with alternate counsel, would they be compensated for assisting the class, or has implementation compensation deemed exclusively the realm of Mr. Seeger? Mr. Levin and Ms. Nast are designated as sub-class counsel. What does this mean and who do they represent? The FAQ provides no answer to this question, however, a previous FAQ version does provide some clarity. Assuming a neurologically challenged retiree should be able to locate this information, should he direct his questions to the council assigned to the subclass he belongs to? It seems to have been established at this point that Seeger is the main point of contact for Class Members who have not retained individual counsel, but if they aren’t happy with his answers or assistance, do they truly have these additional options? It seems “you don’t need a lawyer” has been changed to “there is no requirement that you have a personal lawyer.” This has been an area of much confusion for the Class and as a result, approximately 43% of Class Members are unrepresented by an attorney. In view of the complexity of the claims process, the overwhelming number of deficiency notices issued, and the ease with which a claim can be denied or appealed on procedural rather than medical issues, this doesn’t seem to be good advice. While a final decision hasn’t been made, it appears likely that Judge Brody will implement Professor Rubenstein’s recommendations in regard to a 15% cap on individual attorney fees; in view of this, it would seem prudent for a Class Member to seek out the best lawyer he can find to ensure that his claim is presented properly and has the best chance of success. It seems beyond absurd that a plaintiff should take the advice of a defendant in regard to legal counsel. Whereas the plaintiff wishes to have his claim approved, the defendant wishes to mitigate its losses and see as many claims denied as possible. The reason stated for not hiring counsel seems equally curious: “A settlement attorney was already appointed. . . so adding another layer of attorneys and fees is only hurting him at this point.” Is this really the concern of the Class? 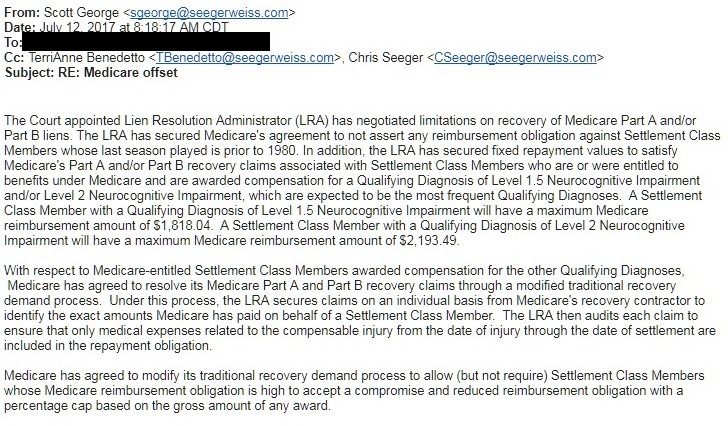 Mr. Seeger seems to be doing well financially if his fee allocation is approved and the slow pace of claims processing and approval seems to be inline with the objectives of the defendant who doesn’t want to hurt him. Considering the confusion, if multiple attorneys have been retained by accident, it’s probably best to deal directly with them for resolution and then inform the claims administrator if changes need to be made. In addition to Lead Counsel Chris Seeger and the other Class Counsel identified above, the common benefit fund is also supposed to compensate other attorneys, including Executive and Steering Committee members for their contributions to the Class. Of the $112.5 million, Seeger has claimed over $70.4 million for himself, leaving the remaining $42.1 million to be divided among 23 other firms supporting the Class and two firms representing Objectors. Seeger recommended that two Objector firms be reimbursed their expense. Of the firms representing the Class, Seeger proposed the highest multiplier of 3.885 to his own firm, followed by a 3.55 multiplier for a law professor who assisted with appellate work when the settlement was appealed. Anapol Weiss, the other member of Co-Lead Counsel was given the next highest multiplier of 2.5. Levin, whom Seeger appointed, and Podhurst Orsek, who also served as Class Counsel received a multiplier of 2.25, followed by Diane Nast with a multiplier of 1.5 and Hausfeld with 1.3. Three firms, including fellow Class Counsel Locks Law received multipliers of 1.25. Almost half of the firms included received the break-even multiplier of “1”. Four firms were assigned a .75 multiplier in which they will be loosing money for their representation of the Class. Others with significant contributions weren’t included at all. Regarding the 5% holdback that Seeger has requested, this has been opposed by numerous attorneys as well as court-appointed expert, Professor Rubenstein. While there are no guarantees, I expect the court will accept this recommendation. These will, as the FAQ stated continue to be withheld from approved awards until the court has ruled. If the court rules according to recommendation, any funds withheld for this purpose will be reimbursed to Class Members. It is true, that anyone who hires an individual attorney will be responsible for his or her pay. Professor Rubenstein has proposed a 15% cap on individual attorney fees. Responses to his recommendation are due January 3, and I foresee opposition, but I believe based on Rubenstein’s recommendations, Judge Brody will order this or a similar cap. An individual attorney will file and defend a claim, and navigate through the changing procedural requirements in the settlement. He may also file motions favorable to his client’s claim and generally the class in general. It is the work of individual counsel that has kept settlement problems visible to the public record and this is a great service, since media coverage has been scant. Considering my 4,000 word elaboration of what an impaired player and or his family must know in order to successfully file a claim, I feel the average person is unprepared to navigate the challenge. Since arguments are often based on questions of law rather than ethical considerations in regard to medical documents, retention of competent private counsel would seem to be money well spent. They are financially motivated, just as Class Members are, to see claims approved. In addition to actual fees, based on the retainer agreement signed, a client may also be responsible for filing fees, court costs, and costs incurred in obtaining medical records, in addition to any other amount the attorney has spent directly on behalf of the client. These are usually nominal amounts in relation to the award, and typically in the hundreds, rather than thousands of dollars. A Class Member can terminate his relationship with his attorney, but for the reasons stated above, it’s probably not a good idea. In addition to this, a Class Member could still wind up owing the contingency fee according to the agreement he signed or up to the cap decided by the court, if any. In regard to fees, attorney terminations and whether money will be owed to them is based on whether the termination had “cause” or was “without cause.” Judge Brody has assigned this determination to Magistrate Judge David Strawbridge. The attorney doesn’t communicate with the Class Member on a regular basis. While attorneys should communicate with their clients, most of the time a lull in communications is an indicator that they are working on claims and there is nothing new to report. 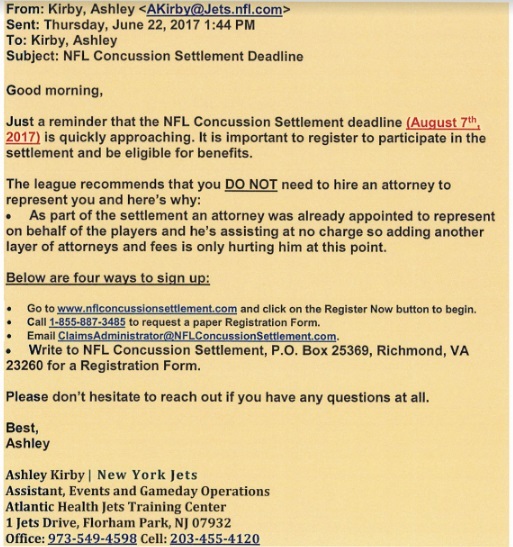 Firms that have hundreds of player-clients cannot spend all of their time in communication in lieu of actually trying to get claims approved. Various firms have different strategies, and some have held off on filing claims in hopes that the “processes” will be resolved and once this takes place, the claims will be filed and completed in a much more timely manner. Most firms, however have submitted numerous claims and working to cure deficiencies and address the requirements the Claims Administrator presents. Sending a client to a doctor for an appointment but upon arrival finding no arrangements have been made. Blatant procedural errors or misrepresentation. Abusive conduct toward a client. Your lawyer will also file a notice of appearance on your behalf with the court, however in order to facilitate matters with the Claims Administrator, the procedure described above should be followed. FAQ 122 begins a section of FAQs dealing with liens. It is the Lien Administrator’s responsibility and obligation to contract with government lien holders such as Medicare to procure discounts or caps on liens in regard to the Class. Very little information has surfaced publicly in this respect. It appears that funds are being withheld for the entire amounts or high estimates of what these lien holders paid for treatment of the qualifying diagnosis. Since these amounts can generally be negotiated down, it would be helpful if the Lien Administrator would provide an update as to any discounts he may have been able to negotiate or if he intends to negotiate the amounts. I searched the settlement website for information in this regard and found nothing on the website to verify that any discounts have been procured, however this email from Scott George of Seeger Weiss to a Class Member seems to indicate that agreement has been reached. 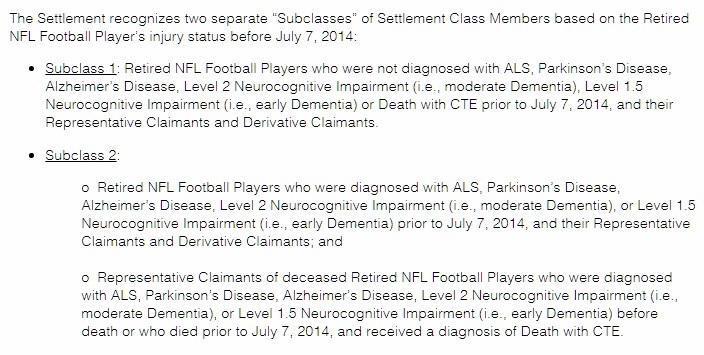 As you can see the amount or percent of compromise was not given in the email for diagnoses outside of Levels 2.0 and 1.5 dementia, or for players who retired after 1980 – but the negotiated amounts for these cases seem reasonable – especially for the pre-1980 players who would likely have their entire awards consumed otherwise. As of January 1, 2018, the following information is posted on the Settlement website in regard to how Medicare liens will be handled. Typically attorney liens are filed by an attorney who was fired by the client and the validity determined on whether the termination was with or without cause. 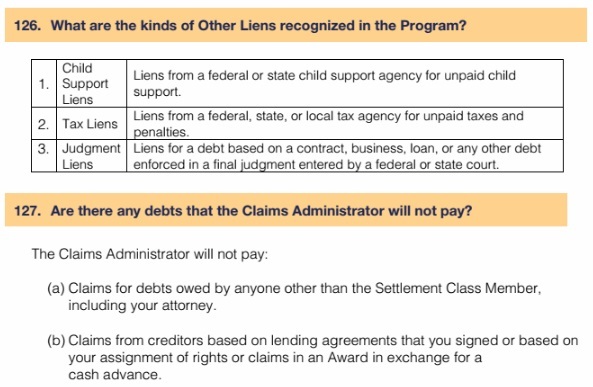 FAQs show what other types of liens may be deducted and which types of debt will not incur a lien – it is worth noting that the FAQ states that cash advances from settlement funders will not incur a lien, however Judge Brody’s ruling in this respect is being challenged by some of those who advanced funds to players. As things stand right now, it appears that a deduction will be made for the amount advanced, but no interest will be withheld from an award. It is also possible that the lenders could file a lawsuit against the borrower in state court, however I believe that Judge Brody will try to reach a compromise to ensure this doesn’t happen. Since this has not reached final resolution, it’s an important issue to keep an eye on. FAQs 128 and 129 deal with the resolution of medical liens. Since 128 is a rather long FAQ, and pretty straightforward, I’ve only included an excerpt here. This would seem to imply that the Lien Administrator will not charge the Class Member for his work in regard to resolving governmental health plan liens. This is not the case, however with private insurers. A Class Member has the option of hiring the Lien Administrator to negotiate on his behalf, or this can be done by the Class Member, or individual counsel representing the Class Member. FAQ 130 informs the Class Member as to how they will be notified of liens. FAQs 131-138 are also pretty straightforward in regard to specific types of liens from government payors. 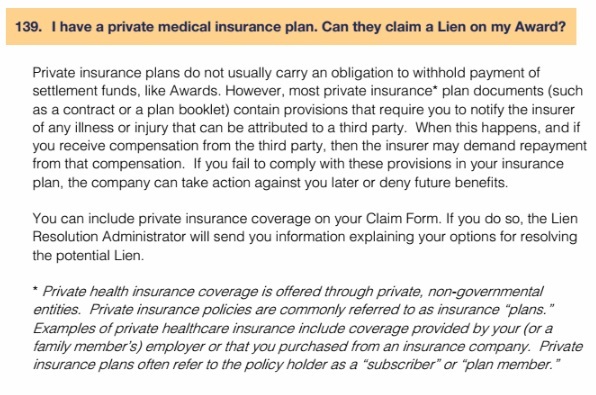 FAQ 139 addresses private insurer liens. These seem to be more problematic than the government liens. One Class Member I’m aware of resolved the matter rather quickly with their insurance company, who agreed not to file a lien against the claim. The paperwork, however went through a number of cycles before the Lien Administrator was convinced that no lien existed. 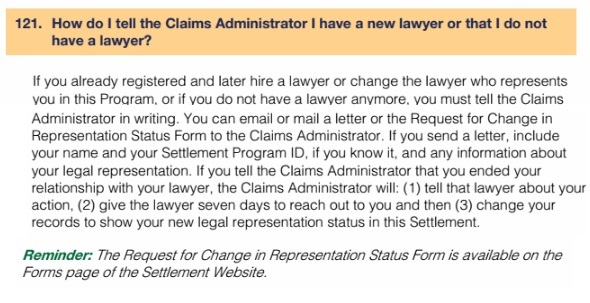 These FAQs are pretty self explanatory and deal with the questions, “What happens if I dispute a Lien?” “How and when is a Lien paid?” and “Will I be notified when the Claims Administrator pays a Lien?” FAQ 143 provides the necessary contact information. FAQs 144-154 provide specific information for lien holders. It might have been more accurate to start with a maximum time for processing rather than a minimum. Most approved claims are closer to the 60-day end of the spectrum, but as one can see from reading the process, there is a lot of processing that takes place before a check is issued. It would be kinder if a neurologically impaired player is pleasantly surprised by quick processing than distress because his check is taking longer than he anticipated. 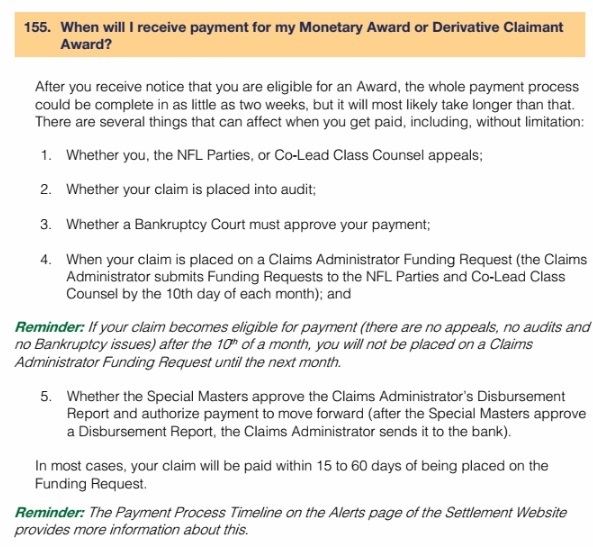 FAQ 156 simply identifies Citibank as the party who will issue awards checks, and 157 describes how this will be done. The Payment Election form can be found on the Settlement website under the “Forms” link at the upper right side of the page. It is identified there as “Law Firm Payment Election Form.” This document will actually be handled by the law firm representing a Class Member. Unrepresented Class Members would use the form above, called “Unrepresented Settlement Class Member Payment Election Form.” FAQ 159 addresses this question for Derivative Claimants. The most logical place for FAQ 158 would have been in the claims section of the FAQs but it was placed one slot before the end. It informs a Class Member that if they appeal an award – for instance on eligible seasons or diagnosis – the entire award will be held up pending the outcome of the appeal. No timeline is given for resolution. FINALLY, four articles and over 10,000 words later, I’ve covered what neurologically impaired retirees need to understand in regard to the Settlement. In reading through the FAQ and elaborating on it, along with the omissions and additional questions it raises, there is little surprise that the Class of ex-NFL players and even their families find themselves confused. It’s a pity what was presented as such a simple and straightforward process has devolved into an obstacle course that is likely impossible for most of the guys to comprehend. So – they wait in frustration for their claims to be approved. The extreme fraud prevention measures cause them to feel as if they are regarded as liars. Depression and anxiety caused by uncertainty and prolonged waits continues to escalate in the retired NFL community. Now, after waiting four long years for Settlement approval, and seeing many of their brethren die during that time span, many wonder if they will survive long enough to receive what they were promised. “Delay, deny, and hope we die,” was famously said by Former Vikings’ Brent Boyd at a Congressional Hearing in regard to unconscionable disability loopholes and denials. Many picked up the chant. They are now resuming it, but this time for the settlement which has yet to live up to its promises.